Iraq was the very heartland of the ancient region of Mesopotamia. Following the collapse of Sumer in around 2004 BC, The region had been home to successive empires (Babylonian, Assyrian, Neo-Babylonian, Persian, Greek, Roman and Parthian or other Persian successors), before it was conquered by the Islamic empire. The caliphate began to weaken in the tenth century, enabling other groups to seize control and for a process of fragmentation to begin. It was briefly independent under the Zangids of Mosul and Aleppo in the twelfth and thirteenth centuries, and then fell to the Mongols. It was inherited by their successor, the Il-Khanate, and then by a rival group, the Jalayirids, who formed their own sultanate which vied for control of Persia. The Jalayirids were a Mongol successor state to the Il-Khans who managed to secure south-western Persia for themselves, ruling it from Baghdad. Their founder had been the governor of Anatolia until the death of the Il-Khan Sultan Abu Said. While attempting to take control of Persia, they tried to maintain puppets on the throne from western Persia, always in opposition to their main rivals, the Chobanids in north-western Persia, while both sides used the surviving Il-Khan Puppets themselves. The Jalayir (or Yyalair) seem to have originated as a unit of the Darliqin Mongols, forming one of the three core tribes of the Khamag Mongol confederation which was a precursor to the Mongol empire. During the rise of the empire they spread across Central Asia and also entered the Middle East under Chingiz Khan and his commanders in the thirteenth century. Those Jalayirs who remained in Central Asia eventually adopted Turkic language and could be found in many of the subsequent Mongol splinter and successor states, starting with the Golden Horde. Those who ventured into Persia were responsible for founding the Jalayirid sultanate. Their name is the Mongolian version of a Turkic name which was used to describe the ruling dynasty of the Second Uigur Kaganate. Included in the Jalayirid territories were parts of the collapsed Turkic sultanate of Rum, but the expanding Ottoman Turks had already taken much of the western Anatolian lands. Instead, the Jalayrids were confined to territory that corresponded to modern Iraq and Iran (western Persia). Ex-governor of Anatolia. First sultan from 1340. The puppet Il-Khan, Musa, is challenged by Hasan Buzurg. His master, Padsah, is killed and Musa flees after being defeated at the Battle of Qara Darra on 24 July 1336. Buzurg maintains his own puppet, the child Muhammad Khan, on the Il-Kahn throne between 1337-1338. Then the Chobanid, Hasan Kucek, defeats Buzurg and Muhammad at the Battle of Alataq on 16 July 1338. Buzurg flees but Muhammad is captured and executed. Following a short flirtation with another claimant, Togha Temur, in 1339, Buzurg's next puppet is Jahan Temur (1339-1340). After this he abandons the idea of puppet claimants to the throne and establishes his own Jalayirid sultanate in Baghdad. 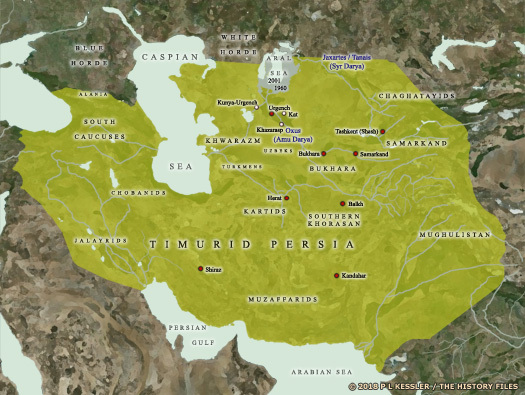 The Jalayirids are conquered by the Timurids from Persia, with Baghdad falling in 1401. They also lose control of their vassals, the Black Sheep Emirate. The sultanate is re-established after the death of Timur. The sultanate is finally conquered by its former vassal, the Black Sheep emirate, in 1432. Following that, Mesopotamia follows the rest of the region by becoming a White Sheep emirate prize (by 1469) and then being held by the Safavids. However, the weak rule of Safi I (1629-1642) allows their sworn enemies the Ottomans to seize a foothold in Baghdad (in 1638) which it does not relinquish, despite occasional, temporary reverses, until the collapse of the Turkish empire at the end of the First World War. The submergence of Il-Khan power in Iraq had been followed by a period of fragmentation, during which first the Black Sheep emirate and then its rival the White Sheep emirate had seized control (in 1432 and 1468/69 respectively). Subsequently the Safavid Iranians dominated until 1638, when a weak shah failed to prevent the Ottoman empire from gaining a foothold in Baghdad in 1638. The Ottomans did not relinquish this, and went on to dominate the entire region as part of their own empire. By the start of the twentieth century, that empire was crumbling, and the First World War finished it off entirely. Between 1916-1918, the Arab Revolt, led by Faysal, son of the sharif of Mecca, and British Army officer T E Lawrence, freed the entire region from Ottoman control (events played out in epic fashion on celluloid in Lawrence of Arabia). The Arabs captured Damascus and secured a semblance of power. The British now controlled the region, and in the subsequent bargaining, Faysal was given the throne of Greater Syria. The French ejected him a year later, so Britain compensated their ally with the throne of the new country of Iraq, which included the former Ottoman provinces of Basra and Baghdad. The province of Mosul was added in 1926. The British Mandate of Mesopotamia controls the region, but increasing unrest in Iraq brings about a decision to create a monarchy for the country which will handle its day-to-day governance. 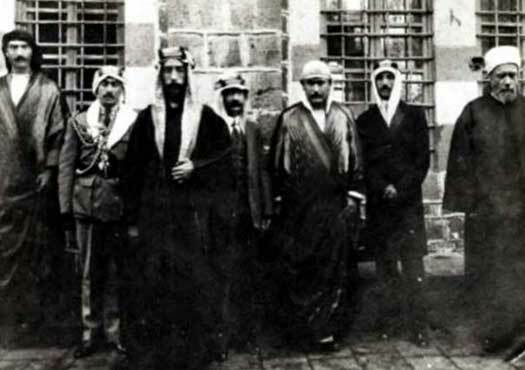 In 1921 the kingdom of Iraq is created within that mandate with the coronation of Faysal I, ex-king of Greater Syria. Son of Husayn, sharif of Mecca. Died 8 Sept.
Faysal is instrumental in bringing about his country's independence from Britain. Son. Died in a mysterious accident. Son. King at nearly 4 years old. Overthrown & shot dead in coup. Uncle and regent. Son of Ali, king of Arabia (1925). A pro-German coup is suppressed during the darkest days of the Second World War in order to secure the oil supply for the British war effort. The country remains under military occupation until 1947. On the day following the proclamation of the creation of the state of Israel, the neighbouring Arab states of Egypt, Iraq, Jordan, Lebanon, and Syria attack, prompting the start of the Arab-Israeli War. Saudi Arabia sends its own military contingent to support the Egyptians. The war lasts for a year before a ceasefire is agreed. The Green Line is established - temporary borders which can be generally agreed by all sides. Egypt gains the Gaza Strip while Jordan controls East Jerusalem and the West Bank region, but an estimated 700,000 Palestinians have been expelled or have fled their homeland, mostly to enter southern Lebanon or Jordan. In light of the creation of the United Arab Republic between Egypt and Syria, Faysal makes the same arrangement with Jordan on 14 February 1958. However, the political situation in Iraq has been deteriorating for some time, especially after the signing of the Baghdad Pact with Britain in 1955, which would allow Britain to retain an influence on Iraqi affairs. Following a coup by the army called the 14 July Revolution, a military dictatorship is set up in Iraq, which becomes a republic. Faysal and several members of his family are shot down in the palace courtyard, and the prime minister is murdered the next day. The Hashemite line continues in Jordan. In 1958, the Arabic name for this newly-created republic was Al Mumhuriya al-Iraqiya ('Republic of Iraq'). The modern republic is bordered by Iran along its entire eastern border, by Turkey in the north, Syria and Jordan to the west, and Saudi Arabia and Kuwait to the south. It reputedly gained its name from the Sumerian city state of Uruk, although this is hotly disputed. One alternative put forward is that the name originates for the Persian word for lowlands, 'eraq'. Iraq's northern city of Kirkuk originated as the Assyrian city of Arrapha. When it comes to names, the two great rivers of Mesopotamia were known by their universal regional names of Purat and Deklath, at least until the Greeks arrived in the fourth century BC. Greeks had been travelling to the ancient city of Babylonia for some time, as traders, Persian military allies, or explorers. Herodotus was one of the latter, but he made it clear by means of omission that the Greeks did not know these names. Instead they were only familiar with the Medo-Persian corruptions of them - Ufratush and Tigra. These names remain in use today, although they have been subtly altered by 2,300 years of change into Euphrates and Tigris. A military coup set up a dictatorship in Iraq in 1958, after which the capital remained at Baghdad. General Qassom withdrew the country from the Baghdad Pact and the Arab Union with Jordan, and established relations with Soviet Russia during the darkest days of the Cold War. The country was controlled by a council made up of Iraq's three main ethnic groups but remained unstable until the 1963 coup. Led by dictators all the way, another coup in 1979 brought Saddam Hussein to power. He remained there, ruthlessly destroying any opposition but overseeing a relatively stable country, until he himself was toppled in 2003. The subsequent Anglo-American-led administration found itself fighting a guerrilla war against Saddam's former loyalists and supporters, as well as al Qaeda terrorists. It took the country until 2012 to find any semblance of ordered peace, only for this to be badly threatened by the eruption onto the world political stage of Isis in 2014. However, the new government has stabilised matters and seems to be forming a more inclusive Iraqi state as a result. Archaeological excavations have been able to restart, often for the first time in decades, resulting in finds such as one of the cities of the mysterious Lullubi. in Kurdistan. Dictator responsible for overthrowing the monarchy. Overthrown. Kuwait is granted full independence from Britain on 19 June with the ending of the protectorate. The sheikh becomes an emir, a prince, and the state joins the Arab League. Iraq renews old claims that Kuwait is part of its territory but backs down following British military intervention. A coup on 8 February sees Qassim overthrown and killed. His position is taken over by a fresh dictator who is a member of the Ba'ath Party, which had been repressed under Qassim's governance. Dictator. Killed in a helicopter crash. Amid ever-increasing tensions and acrimonious relations with Israel, Egypt expels the UN peacekeepers from the Sinai and announces a partial blockade of Israel's access to the Red Sea. Expecting further military action, several Arab states begin to mobilise their troops. Israel sees this as reason enough to launch a pre-emptive attack against Egypt, Iraq, Jordan, and Syria, triggering the Six Day War. Jordan loses the West Bank and East Jerusalem, a third of the kingdom, while Israel also gains the Golan Heights and the ancient region of Bashan from Syria, and the Gaza Strip from Egypt, and also temporarily occupies the Sinai peninsula for a second time. A third coup, this time bloodless, leads the Ba'ath Party to power (a political rival to the party of the same name in Syria), with Saddam Hussein as its security chief. He seizes ultimate power ten years later, killing many to secure his position at the top. Hussein claims that the new revolutionary government of Iran is attempting to topple him from power. He declares war and the border between the two countries is a permanent battlefield for nearly a decade. Iraq is supported strategically and financially by Kuwait. Hussein occasionally employs chemical weapons on his enemy, but the two sides are evenly matched and the war ends in stalemate. The First Gulf War is triggered when Kuwait is occupied by Iraq. A United Nations coalition army is assembled in Saudi Arabia under the control of the USA to force them out, with heavy Iraqi losses. Saddam Hussein survives in power, however, as the allies fail to follow up their victory with an invasion of Iraq itself. 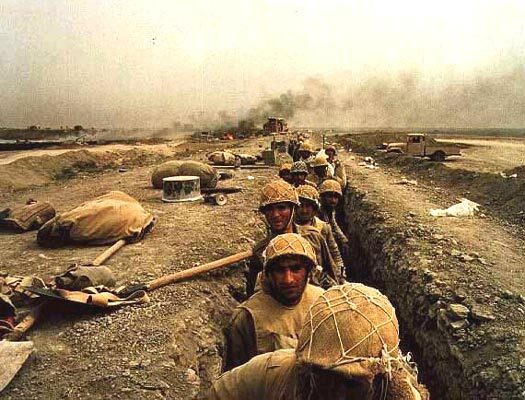 An Anglo-American-led Second Gulf War leads to the collapse of Hussein's regime after just twenty-one days of fighting. Hussein is eventually captured, after having been located in an underground bunker (more of a deep fox hole). He is tried by an Iraqi court, and at the very end of 2006 sentenced to death by hanging for his crimes. A democratically-elected Iraqi government takes control in 2005, ending the Allied administration of the country, although Allied troops remain for several more years to aid in maintaining security and training the new national army and police forces. Iraq's democratic government had gradually assumed more responsibility for running the country while the allies gradually withdrew their forces. However, Prime Minister Nouri al-Maliki was repeatedly accused of filling official positions with his Muslim Shia allies at the expense of the country's other main groups, the Sunnis and Kurds. To make matters worse in a highly unstable region, the 'Arab Spring' of 2011 had kick-started a civil war in neighbouring Syria which created several opposition groups. Suddenly in 2014, one of those groups, known generally as Isis (Islamic State in Iraq and Syria), launched a sweeping campaign in Iraq which gained them large areas of the north-west, extending almost into Baghdad itself. Initially stunned and helpless, Iraqi forces began a slow fight-back, but the Islamic State is still proclaimed on 30 June 2014. The Kurdish population of north-eastern Iraqi, always strong and self-sufficient, secures its districts against the Isis fighters. The Kurds also use the opportunity to take over disputed territories in Kirkuk, Nineveh, Salahuddin, and Diyala provinces, including the oil fields around Kirkuk and other newly discovered oil or gas fields. Having consolidated its territory in 2014 and established a reputation for medieval brutality, the self-proclaimed Islamic State suffers its first substantial setbacks. Western and Arab forces unite to provide Allied air cover for Iraqi and Kurdish resistance. The town of Kobane on the Turkish border is successfully defended by the Kurds with allied air support (although Turkish tanks sit inactive on the hillside above the town, apparently with orders not to support the Kurds who are otherwise seen as a threat to its own security). By February 2015, the Kurds are making careful strategic advances further south.